Assassin’s Creed Origins is due for release on PC, PS4 and Xbox One this coming Friday, 27th October. Ahead of the release Ubisoft has been busy generating news-flow with trailers, details of the season pass, bundle deals, and so on. Importantly, over the weekend, we learned of the game’s minimum and recommended PC specs and heard some encouraging sounds from the developers responsible for the PC version. Ubisoft says that “optimizing the game for PC play has been very important,” with Assassin's Creed Origins, reports GameSpot. Interestingly, the minimum system requirements are the same as Assassin's Creed Syndicate, which was released two years ago. 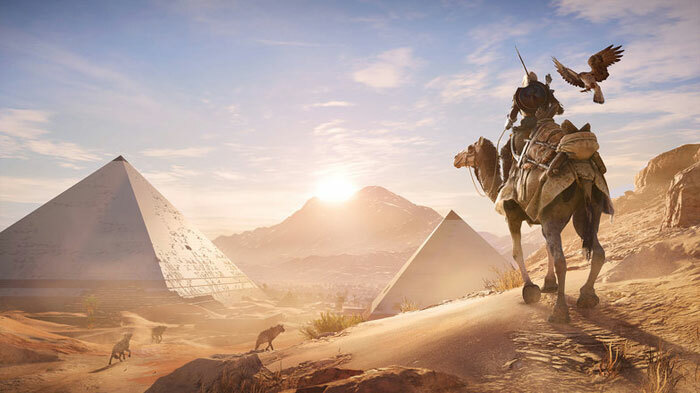 The main Ubisoft Montreal team, behind the new game, worked in parallel with the PC-dedicated team at Ubisoft Kiev, said Assassin's Creed Origins coordinating producer Jose Araiza. “This approach was adopted while the game features were being designed, making PC and mouse-and-keyboard controls a full part of the equation from the get-go,” Araiza explained. Assassin's Creed Origins is, as hinted by the name, a game that goes back to the origins of the story, the origins of the centuries-long conflict between the Brotherhood of Assassins, who fight for peace by promoting liberty and The Order of the Ancients—forerunners to the Templar Order—who desire peace through the forceful imposition of order. Players take on the role of the first ever such Assassin, Bayek, as he works to protect the people of the Ptolemaic Kingdom during a time of widespread upheaval in ancient Egypt (during, approximately, the Cleopatra and Julius Caesar eras). It remains, in gameplay terms, an action-adventure stealth game played from a third-person perspective and features an open world environment, crafting and a whole new combat system. “optimizing the game for PC play has been very important"
but I bet it still isn't properly optimised. I never managed to get into these games, Black Flag I completed (possibly 100%, can't quite remember), but the others ones that I played felt forced and dull. I can't really believe that they're still milking it - but if people are still buying, then fair play. I've tried a couple of times - gave up trying to get in to AC1, I think AC2 was the other one I attempted, and I bought Syndicate on offer, which is sitting installed but unplayed as of yet. It's pretty much set the template for any of Ubi's ‘open world’ games though, from Far Cry to Watch Dogs to Ghost Recon Wildlands, it feels very much like a new coat of paint on the same base game IMO. I mean they tend to sell well, but it became boring for me a while ago and even for games I enjoyed overall like Wildlands, it still felt unoriginal and repetitive. Same here, Black flag had that great feel every point of the game almost like taking a vacation in the beaches, still great for multiple play-through.